The program is used for receiving digitalized signals from server computers. Network data transfer is highly required in distributed measuring systems as well as educational laboratories. 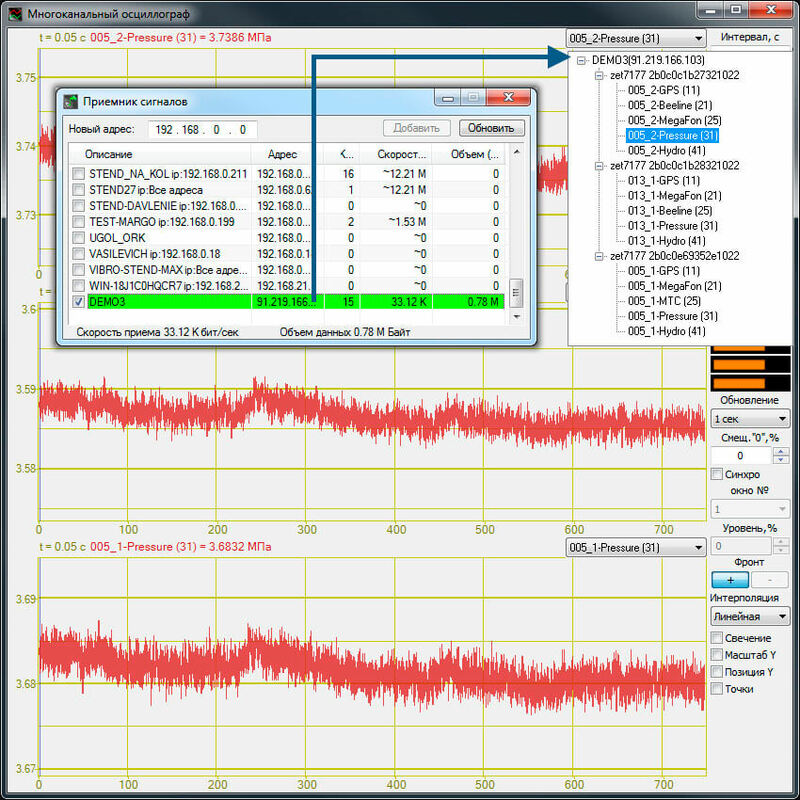 The figure below shows Data Client and Multichannel Oscillograph windows. The data client can be used for connecting the ZETLAB DEMO server. The DEMO server channels will appear in the oscillograph signal list. In the Signal Receiver (Data Client) window specify the IP address of the computer which serves as the data server. If the connection is successful, the digitalized signal speed and volume of the received data are displayed. signals received from data servers. As soon as the signal transmitter turns on, any computer located on the same subnetwork can connected to it via the program Signal Receiver (Data Client) – and all signals of the server computer appear in its channel list. Then it does not matter whether these signals are processed by the server computer or a computer to which they are coming via the Signal Transmitter (Data Server)→ Signal Receiver (Data Client) system. Signal Receiver (Data Client) is included in the Network software group.